Bijoux Burlesque would like to offer a huge congratulations to Kate and William on the birth of their son, George. As the whole country waited with baited breath for the birth of the heir to the throne, we were busy throwing super parties the length and breadth of the country he will one day rule! We really are a multi-cultural country and this shows with the unique and differing styles of party that we provide here at Bijoux Burlesque. From Salsa hen parties to Hawaiian Hula Hen Parties, and Bollywood Hen Parties to Cheer leading Hen Parties, we have something for everyone. So lets embrace our colourful nation and party on! At Bijoux Burlesque we love music, art, performance and general frivolity,so to us, festivals are places to be inspired! We particularly love all things circus.We are in awe of the death defying aerialists and the beautiful dancing girls. 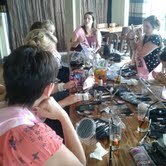 We have incorporated this into our events by holding regular hula hooping hen parties! You can get a taste of the excitement of being a performer when you book onto one of hooping dance parties,and if that's not enough, you will be trimming your waistline with every swirl. Our hula hooping hen girls in London this weekend said their party was better than Glastonbury......mind you, you will never see us sophisticated ladies sloshing around in all that mud! We will definitely be glamping, not camping!